Prior to getting that book, I was what is known today as a “reluctant reader.” But after receiving Brian McFarlane’s Hockey Annual, I couldn’t get enough of the written word. I consumed that tome cover to cover hundreds of times, used the information in it for class projects and speeches and because of it, became a student of hockey history. I swear there were passages from that book that I could recite verbatim. From there, I picked up every other hockey book I could find and read each one voraciously. And now, when I look back almost 30 years later, I can trace my chosen profession back to that one book. Becoming a reader made me want to write and wanting to write, combined with my passion for hockey, led me to journalism school at Carleton University and a career in hockey journalism. I’d call it a job, but it rarely ever feels as though I’m working. I’ve covered Stanley Cup finals, World Junior Championships and Olympics and travelled the world, in large part because of the seeds that book sowed in 1973. I still own it, in fact. Actually, I’ve already passed it down to my 13-year-old son Lukas, and he vows to keep it for his son. 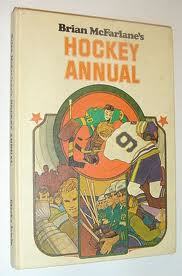 Was there ever a hockey book from your youth that had a profound effect on you? For me I have a fairly similar story with Stan Fischler's Hockey's 100. Tell me your influential hockey book from your youth.